April was a selling month for me. I sold off SCGM and ABRIC with around 50% and 25% gain respectively. Apart from that, I also made a decision to make a cut loss on my holdings in PJDev warrant (~-10%). All the proceed generated was transferred to my foreign trading account, looking to buy more HK counters in future. Apart from PJDev and CES that had just past their respective dividend ex date this month, other counters mostly moved up. Sunway is closing in to list its SunCon unit. I probably will dispose it since the quantity is quite small. 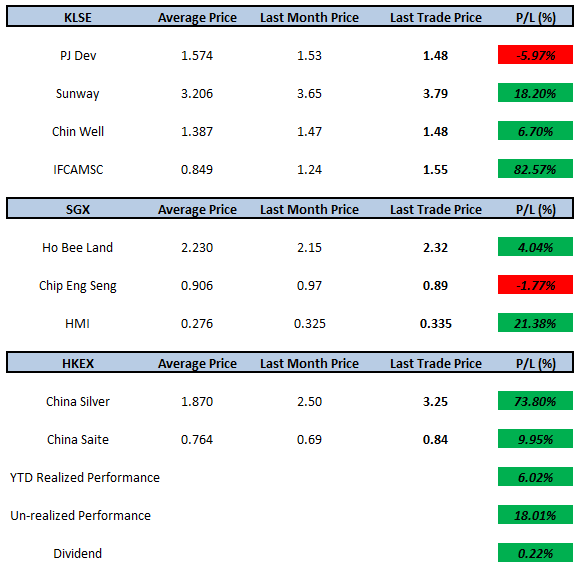 IFCAMSC and China Silver moved up a lot this month. IFCAMSC appeared in news media quite often recently, mainly due to its >1000% return for the past 1 year and also its growth story moving forward. Have to keep monitoring to make decision whether to realize the profit or not. Moving forward, have to study more HK companies as I still have some spare cash along with the proceeds generated last month to invest on it. I'm using Hong leong investment bank to trade HK counters. Can I know which foreign trading account you are currently engage with? I plan to trade HK too, any HK bank you open and how you transfer back to MY account?